Luminosity mask is an incredibly powerful image editing tool in Photoshop (and software that support layer masking). It allows you to make targeted and seamless self-feathering selections in your image to apply any adjustments you like. Good image post-processing is all about local adjustments - applying the right amount in the right place without affecting the entire image (global adjustments). This is how professional looking images are produced. This is how you should be creating your images! 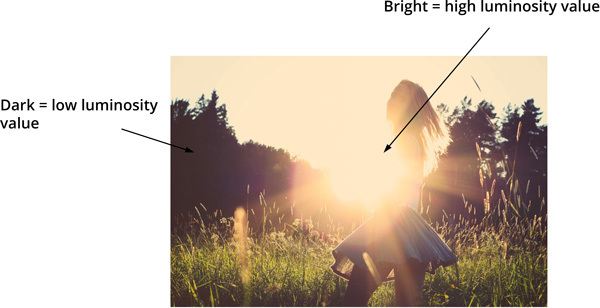 The technique of creating selection based on brightness was first described by a photographer based in Arizona. Luminosity mask has been refined over the years and it has become even more versatile since with the introduction of infinity mask. Mastering luminosity mask is not difficult and you certainly don't need to be a Photoshop wizard to know how to use it! All it needs is some time and patience to go through its learning curve (which is what this tutorial is about!). If you're new to Photoshop, I encourage you go through the Photoshop Video Library. It will help you learn the skill easier. In this tutorial, I'm going to give you an overview of how luminosity mask works, how to use it for basic adjustments and the pitfalls you may encounter. If you still struggle to understand it towards the end of this tutorial, check out An Idiot's Guide To Making Sense of Luminosity Masks, an article I've written in hope to bridge the gap. It doesn't cover the technical aspect of luminosity mask (i.e. how it actually works). But if you're interested, here's a pretty good article for you. If you’re looking for in-depth articles on post-processing with luminosity mask, check out the tutorials section for exposure blending, tonal and color adjustments. Luminosity mask is basically layer mask. 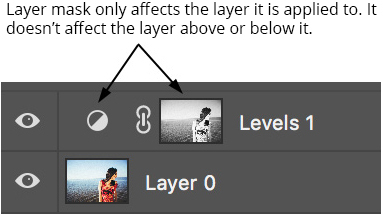 So to understand how it works, you must already know how layer mask works. It’s essential and the absolute fundamental you MUST know beforehand. Otherwise none of these is going to make sense. Everything about luminosity mask builds on the basis of layer masking. This is because it’s essentially a layer mask. Fortunately, it’s not a difficult to master layer masking. Why not check out the official video tutorial on layer masking by Adobe. 1. What Is Luminosity Mask? 3. What Software Do You need? 4. Where Is It In Photoshop? 5. How To Create Luminosity Mask? It’s a selection tool based on the luminosity value of the image. Once the selection is made, it is then applied as a layer mask to conceal or reveal part of the image. 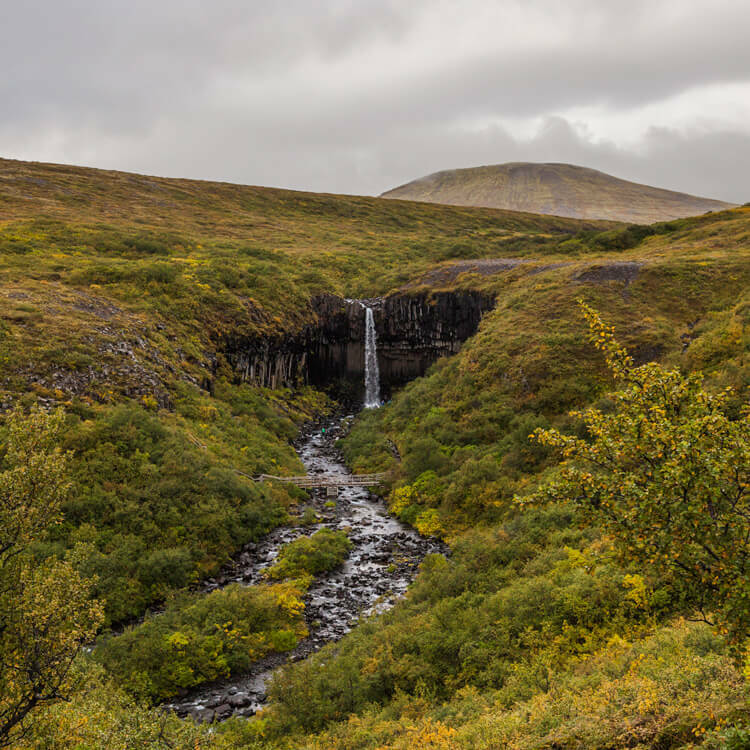 It was first published by Tony Kuyper in 2006 and has since been adopted by photographers in their workflow. To sum it up, it’s the brightness of the pixels. A pixel is the building block of an image. Thousands and millions of pixels of different color make up an image. Every pixel has a luminosity value (0-100%). This determines how bright or dark it is. Selection made with the Quick Selection Tool (middle) and luminosity mask (right). Unlike other selection tools in Photoshop, luminosity mask allows you to create highly targeted selection with seamless feathering. Have you tried creating a selection of the sky but just can't get what you want selected properly? There will always be parts that get left out or unwanted parts included in the selection. Using luminosity mask, you can achieve that desired result more efficiently. What can you do with luminosity mask? You can use it any way you want. The possibility is only limited by your imagination! In fact, I encourage you to experiment with it and try to think outside the box once you're clear on the basics. As the name implies, it involves merging images of the same frame but taken at different exposure. In photography, the process of merging images can also be called blending. 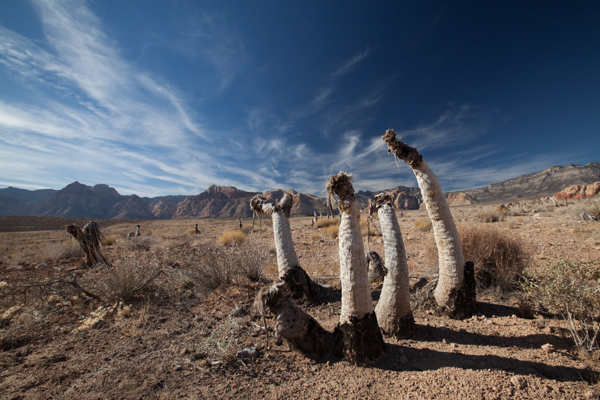 Images are often blended together to create a high dynamic range (HDR) image. 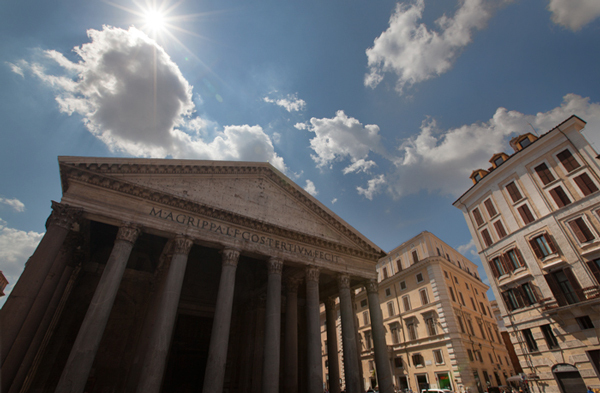 You can learn more about HDR here: The Ultimate Guide To HDR Photography. "But, aren’t there HDR software to do that already?" You’re absolutely right, there are plenty! But some photographers don’t like the so-called “HDR look” created by HDR software. These images are typically oversaturated and unnatural looking. The main advantage of blending over HDR software is that you can decide where and how much you want to blend the images. With luminosity mask, you have more control and flexibility over this process. 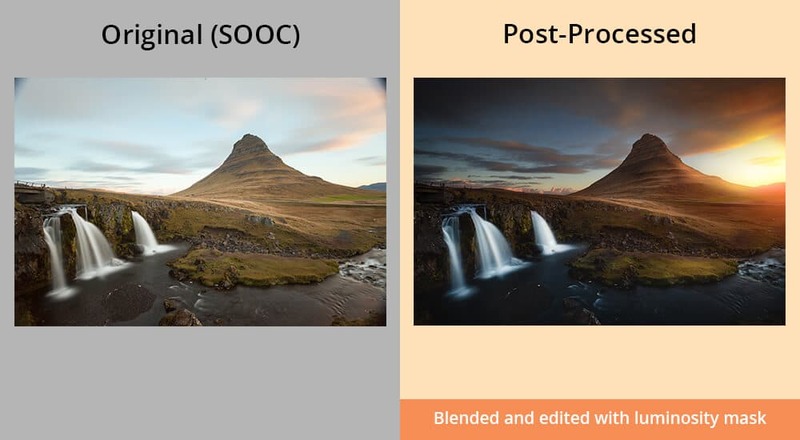 The blended image is often thought to be cleaner and more natural, especially among nature photographers. If you're interested to learn more, check out The Ultimate Guide To Exposure Blending. The image above shows what local adjustment is. With luminosity mask, I applied a Curves adjustment to reduce the highlights in the sky without affecting other parts of the image. The Curve adjustment to the highlights is targeted and localized to the sky only. Global adjustments throughout post-processing is a thing in the past now. Yes, we still do that but sparingly. What makes more sense now is targeted local adjustments. Let's take the above image for example again. To select the sky, you'll have to use a selection tool. This process can be time consuming depending on the complexity of the image and you probably have to refine the selection a few times. Still, the result may not look as natural as you like it to be. It’s frustrating, unproductive and increases unnecessary time spent in post-processing. With luminosity mask, you can get the selection quick, precise and with seamless feathering that allows any adjustments to blend in naturally. Personally, I use Adobe Photoshop. I think it's a very robust and versatile image editing software. To use the software, you need pay a low monthly subscription fee (Adobe Creative Cloud) to get both Photoshop and Lightroom under the photography bundle. You check out their free trial here. Again, personally, I think it’s of good value. I know there are many who have other opinion and that's ok. 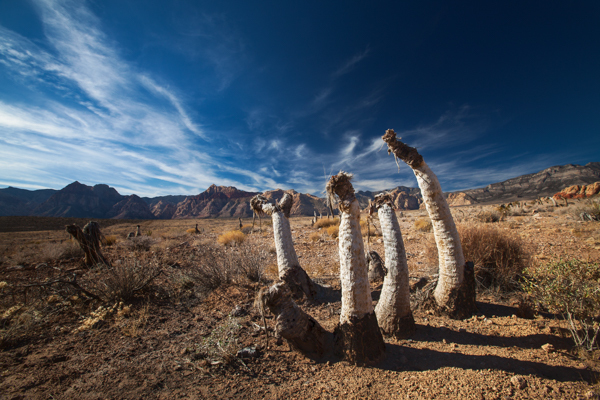 The bottom line is, Photoshop is not the only software which you can use luminosity mask. 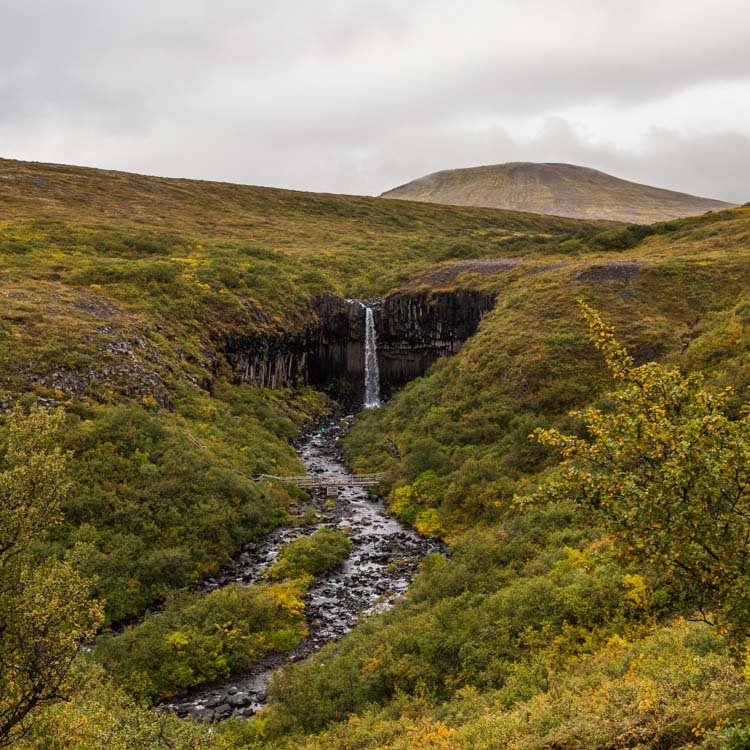 The other software that is also popular among luminosity mask users is GIMP (freeware) and Affinity Photo, which has a slightly different way of applying luminosity mask. Luminosity mask is not a standard tool in Photoshop. By that I mean there isn't a menu or an icon where you can click to access it directly. It's actually tucked away in the "hidden corner" called the channels panel. 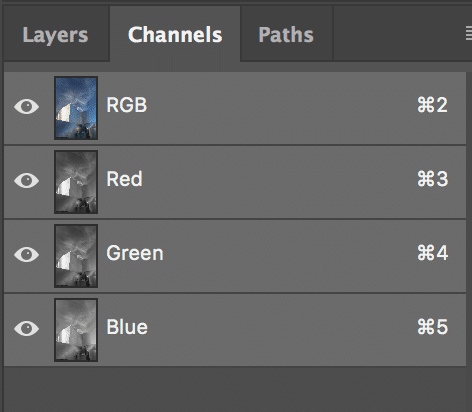 By default, Photoshop only generates three color based luminosity masks for every image: red, green and blue. As you can see, our choices are going to be very restricted if we were to use the default masks. So, we need to create more variations. We'll go through the steps on creating the masks later on. A set of luminosity mask targets all three main zones of an image: the highlights, the shadows and the midtones. These are often called brights, darks and midtones masks. Similar to a layer mask, white reveals, black conceals and grey partially reveals or conceals depending on the luminosity value. Creating a set of luminosity masks manually is time consuming. You wouldn’t enjoy spending 5-10 minutes creating it for every image. Automation! Yes, it’s about working smart, not hard! Here are a few ways to automate the process of creating the masks. Create it yourself once, record it and save it as a Photoshop actions. You can then automate the process the next time you need it. Download the luminosity mask Photoshop Actions here for free. Download one of the free Photoshop luminosity mask panel which I’ll explain below. 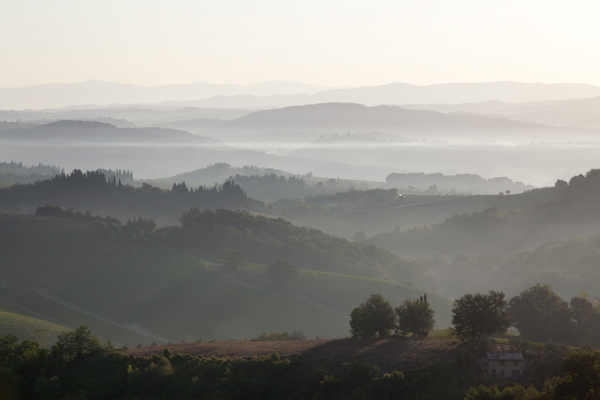 To help you understand luminosity mask better, we'll go through the steps to create these masks manually. You’re going to use the channels panel, rather than the layers panel that you normally work in. I use a Mac, so bear in mind that Cmd = Ctrl in a PC and Opt = Alt. Remember to save it as Photoshop Actions so you don’t have to repeat this painful process again. Go to the channels panel. Cmd + click on RGB and save the selection as a new channel by clicking the little button at the bottom of the channels panel that looks exactly like the layer mask icon. Now you should see the new channel saved as alpha 1. Without deselecting, hold down shift + cmd + opt and click on alpha 1 to intersect the selection. Again, save it as a new channel by clicking the little button at the bottom. You should now see it saved as alpha 2. Repeat step 5 and 6 until you reach alpha 6. Now rename all alpha 1-6 to brights 1-6. These are your luminosity masks for highlights. Now deselect the selection by holding cmd + D. We’re now going to create the dark masks (which are the inverse of brights masks). Cmd + click on RGB again. Now we need to inverse the selection by shift + cmd + I. Save this as a new channel by clicking the little button at the bottom again. You should see it saved as alpha 1 (this is because you have renamed the previous alpha 1 to brights 1. Don’t worry about the name as you are going to rename it later). Without deselecting, hold down shift + cmd + opt and click on the new alpha 1 to intersect the selection. Save this as a new channel, which should be alpha 2. Repeat step 11 and 12 until you arrive at alpha 6. Now rename the new alpha 1-6 to darks 1-6. These are your luminosity masks for shadows. Cmd + D to deselect everything. Now we need to subtract shadows from the brights to create the midtones masks. Select everything by Cmd + A, then hold down cmd + opt + left click on brights 1 and then darks 1 to subtract both. Save the selection as a new channel by clicking the little button below. It will be saved as alpha 1 (again, don’t worry about the name). Repeat step 16-17 for brights 2 and darks 2, brights 3 and darks 3, etc. until you arrive at alpha 6. Rename all new alpha 1-6 to midtones 1-6. These are your luminosity masks for midtones. Created by photographers for photographers, these are designed to enhance your experience in using luminosity mask. Besides creating the basic masks, each luminosity mask panel offers different features and tools for post-processing. Below is a list of free luminosity mask panel. Each of them also has a premium version which has more advanced features. Do you need a panel to use luminosity mask? - Absolutely not! I didn't get one of these until recently. These are meant to make your workflow more efficient. Each panel works works differently and obviously has different layout. My suggestion is to try on the free panel before you take out your credit card! If you like to read reviews of these panels, here's a comprehensive article on that. Grey = Gives the layer different levels of transparency depending on the amount of grey there is. A layer mask only affects the layer it applies to. Bright masks – The brightest areas are in white, less bright areas are in different shades of grey and the shadows are in black. The selected area becomes less from brights 1 to brights 6. Dark masks – The darkest areas are in white, less dark areas are in different shades of grey and the highlights are in black. The selected area becomes less from darks 1 to darks 6. Midtones masks – All masks are filled with different shades of grey. More midtones are selected in midtones 6 than midtones 1. Luminosity mask is a way of creating a layer mask. The advantage of it over other selection tools is its ability to produce highly targeted and customizable selection with seamless feathering. Once you have the selection you need, you can then apply any adjustments to it - different kinds of tonal, color adjustments, sharpening, etc. Now that you've learned the basics of luminosity mask, I feel it's time to dive into some action! Exposure blending is a post-processing technique to blend images of different exposures together. Its aim is to create a high dynamic range (HDR) image without the need to use an HDR software. The post-processing time is longer than an HDR software but the image is often more tonally balanced and natural. Exposure blending stimulates your creativity, gives you total control of your image and forces you to learn how to post-process images yourself instead of relying on presets or filters. 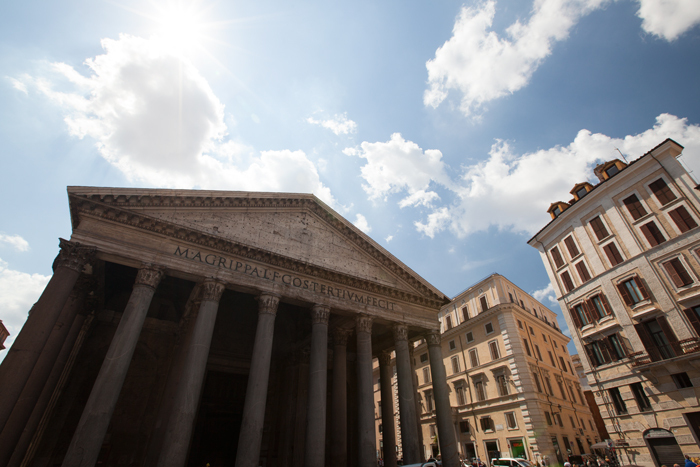 To give you an example, I’m going to use the image of the Pantheon taken in Rome. 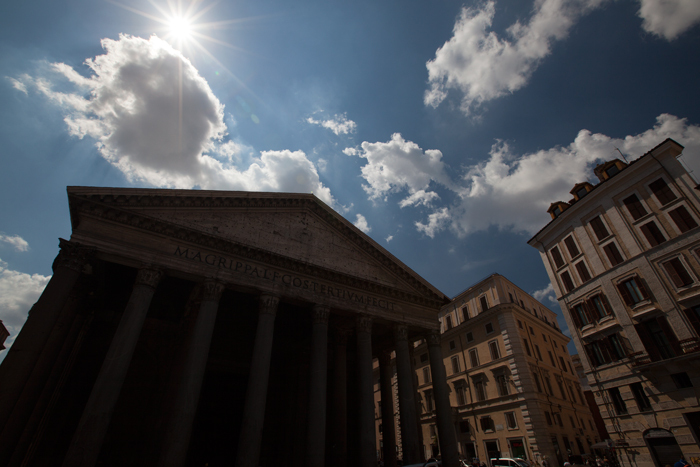 In the first image, I’ve exposed for the foreground (the buildings), which left the background (the sky) overexposed. This is because the dynamic range of the scene had exceeded what my camera could capture. Exposure bracketing was necessary to ensure the full dynamic range was captured. Even though the shadows between the pillars seem dark, I know from the histogram that there’s no shadows clipping and I could recover the details in post-processing. In the second image below, I’ve taken it to expose for the background (the sky), which left the foreground (the buildings) underexposed. The aim here is to blend the foreground in the first image with the background in the second image using luminosity mask. I opened both images in Photoshop. I used the first image as the base image to create a full set of luminosity masks. 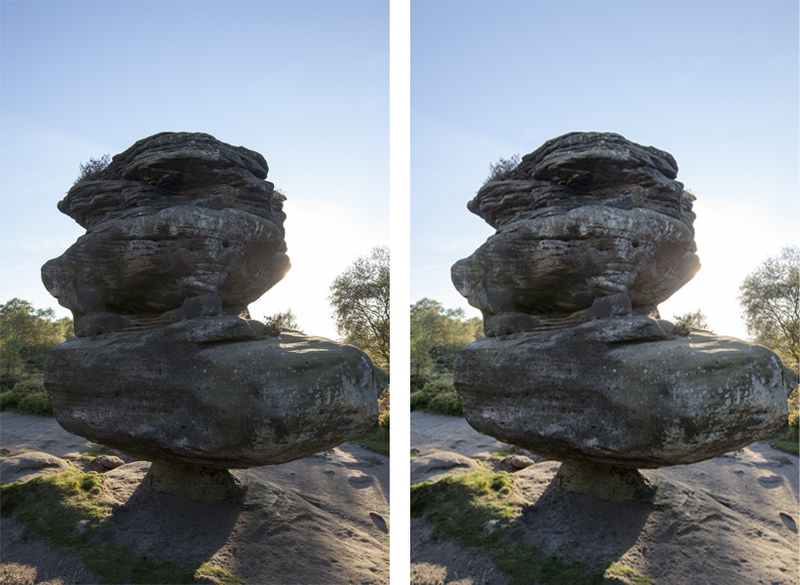 My aim was to replace the overexposed sky with the sky in the second image. Because the area I wanted to replace was bright, I needed to use a bright mask that targets only the sky. 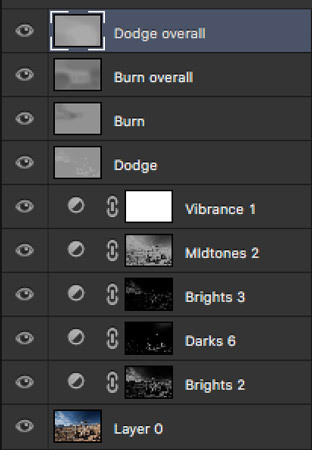 With a single click, I used Photoshop Actions to create all 18 luminosity masks without having cramps in my fingers. These were the 6 bright masks in the channels panel. I wanted to pick one that has only (or most) of the sky selected (in white). I also wanted to exclude the buildings from my selection, so the buildings should be in black (or darker shades of grey). Looking through the bright masks, I thought Bright 2 or 3 were the most suitable ones. I picked Bright 2 in this case. Experiment is often the key to success in blending and post-processing in general. I encourage you to experiment with different masks (maybe start with the adjacent ones) to see which gives the best result. Place the first image as the first layer and the second image as the second layer. Align the images by going to Edit > Auto-Align Layers. I did this because I shot the bracketed exposures handheld. Create a layer mask for the second image and fill it with black to mask everything. Now you should only see the first image because the second image is now invisible. Cmd + click to select Bright 2 luminosity mask from the channels panel and then click on the layer mask on the second image in the layers panel. You should now see the marching ants, which means selection from the luminosity mask you selected is now active. Now select the brush tool, set the size to large and hardness to 0 (you want a large, soft brush). Make sure the foreground is set to white and start painting the layer mask in the sky to reveal the sky in the second image (top layer). If you find the marching ants annoying (which I often do), cmd + H to hide them. The selection will still be there but you won’t see the marching ants now. There are certainly other ways to blend images and this is just one way to do it. It's a relatively straightforward example of how to blend images with luminosity mask. There are other advanced blending techniques with luminosity mask. I have provided some useful links at the end of this tutorial if you like to learn more. Another way of using luminosity mask is to apply adjustments in targeted areas only. To do this, I highly recommend you use a RAW or TIFF file instead of a JPEG because of bit depth. You want the highest number of colors available to avoid posterization. For demonstration, I'm going to use this image below to show you how to apply localized tonal adjustments with luminosity mask. The image was taken near midday so the it looks a bit flat and washout. Let’s bring it to live! Everything starts with “create luminosity mask” for the image. These are the layers I’ve applied to the image. Let’s go through it together! Layer 0 : I double clicked the background image to convert it to a layer. Layer 1: Curves adjustment layer applied to a Brights 2 to reduce the highlights. Layer 2: Levels adjustment layer applied to Darks 6 to brighten the shadows of the cactus. Layer 3: Curves adjustment layer applied to Brights 3 to reduce the highlights further. I changed the blend mode to multiply. Layer 4: Curves adjustment layer applied to Midtones 2 to bring up the overall contrast with a S-shaped curve. I changed the blend mode to luminosity to preserve the color saturation. Layer 5: Vibrance adjustment layer to boost the overall color. Layer 6 & 7: Dodge and burn with various brights and darks masks targeting only the clouds and the shadows of the cactus. Layer 8 & 9: Overall dodge and burn to create a vignette. Here’s the before and the after. The adjustments are subtle but it does make the image look more contrasty. That’s the advantage of post-processing with luminosity mask. You apply subtle changes to parts of the image but everything adds up to the overall effect. If you look at the top right-hand corner (the deep blue sky), the tone and color have not changed because it was protected by luminosity mask. This wouldn’t be possible if we’ve applied the adjustments globally. Even with layer masking, the transition wouldn’t be as smooth. Luminosity mask is a great tool, not the perfect tool and it does have some limitations. In this section, I'm going through some common ones you may encounter in your workflow and show you how to overcome these pitfalls! A pain and an unsightly problem. It's caused by a significant difference in the brightness of each bracketed images. The interval between the bracketed exposures is too wide and there isn’t enough tonal information to fill in the gap. This typically happens in high contrast scenes like this. It was in the evening but the sun was still very bright. I spotted an interesting rock formation and used it to frame the sun. I’ve bracketed 3 exposure as below. As you can see, the brightness in the +2EV is greater than the brightness in the 0EV and the -2EV. There is a big gap between the brightest and the darkest image, and there is only 1 image in between for tonal transition. Take bracketed exposures at a closer interval to ease the transition from the darkest to the brightest. In this case, 5 or even 7 bracketed images with 1EV apart (or even smaller) may have helped to reduce or even avoided the halos. Before (left) and after (right). The edited image looks brighter but flat and uninteresting. It may seem intuitive to brighten the shadows with a darks mask when you want to see more details in the shadows. It works for highlights so it should work the same for shadows, right? If you see the luminance mask on the far left below (Darks 2), the whitest part falls on the darkest area of the rock. This means the darkest shadows are all selected. If you brighten that up, all the shadows, including the darkest shadow will be brightened. This causes the image to lose overall contrast and becomes flat. Before (left) and after (right). The edited image now looks brighter with the contrast preserved. You want to brighten the shadows and maintain the contrast at the same time. Contrast is when there is a difference in the darks and the brights. This means preserving the darkest shadows (maybe you can brighten it up a little) while brightening the less (or least) dark shadows. Dark or bright edges sometimes occur when you try to blend images with high contrast together (it’s always high contrast causing problem!). It often appears on the outlines such as tree branch (in this case), rocks or mountains. It’s actually not easy to spot them without zooming into the image. If you can’t see it, why fix it? You're right. But if you happen to print your image large, it will show up and ruin your print. On the other hand, fixing it only takes a few minutes and there’s no reason not to do it. 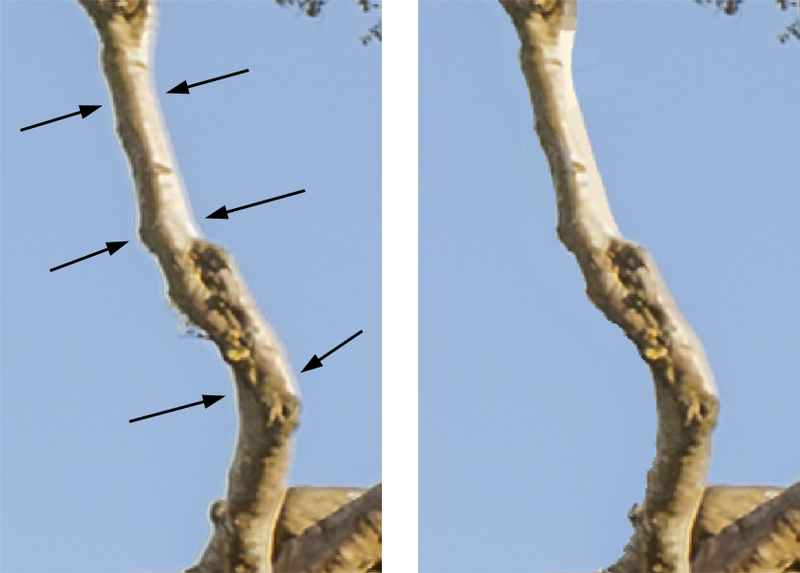 In this example, you can see the edges of the blue sky painted over the tree branch on the right. 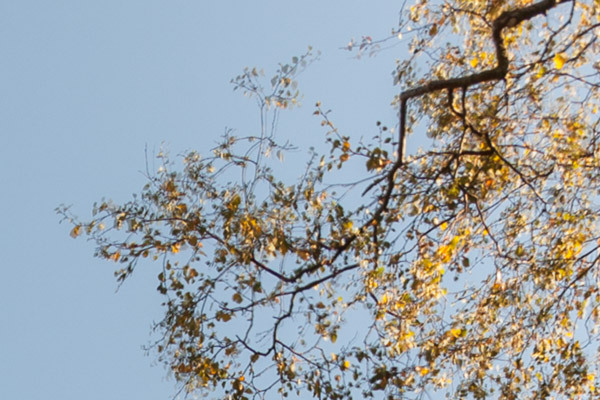 On the left, it did the opposite, leaving a white edge between the blue sky and the tree branch. The way to fix it is to reverse select and paint over it. I’ll explain. To fix the white line on the left, select the magic wand tool in Photoshop. Set the tolerance to 15 (in this case) and make a selection of the tree branch. Now, modify the selection by going to Select > Modify > Contract, and retract the edge of the selection by 1 pixel to exclude the white line from the selection (2 or 3 pixels if you have a thicker white line). Inverse the selection so that the sky and the white line are now selected instead. Select the brush tool, change the foreground color to the color of the sky by opt/alt + click on the sky and paint it over the white line. For the over-painted area on the right, do the same except select the sky first and inverse the selection after. The inverse selection method can be used in any situations where edging is present. There will be times when you find none of the luminosity masks have the selections you need. The mask can either over-select (including areas that you don’t want) or under-select (not including areas that you want). Here are a few tips to help you refine a mask or create a custom mask for your selection. Add or subtract luminosity masks. You can combine multiple masks together or subtract one from the other. To do that, cmd/ctrl + click on a luminosity mask, then add other masks by holding down shift + cmd/ctrl + click. You can add as many masks as you want. Opt/alt + cmd/ctrl + click to exclude a mask from your selection if needed. Right click on the mask in the layers panel and select refine mask. Change the view mode to black and white and use the adjustments below to refine your mask. Use color range. Go to Select > Color Range. At the bottom of the panel, change the selection preview to greyscale so that you can see the changes directly on your image. You can play with the fuzziness to refine your selection or pick a color from the drop-down menu. To sample a color, use the eyedropper tool on the right and click on the area in the image you want to select. You can add or subtract selection by using the + or – eyedropper tool. This creates a color based mask instead of a tonal based mask. Strictly speaking, this is not a luminosity mask but it helps you to get round the problem. Learn more: Create Custom Mask With Color Range. It’s a head scratcher in exposure blending. In an HDR software, you can use de-ghost to fix the problem. In exposure blending, there are ways to deal with it. So how does ghosting look like? If ghosting is not obvious and only affecting a small part of the image, you can reduce the opacity of the layer or use the clone stamp tool or healing brush to fix it. But that’s not an option in this case. The solution here is double processing. No, I don’t mean editing the image in both Photoshop and Lightroom. It’s a post-processing technique where you take a single Raw image and make a duplicate copy. You brighten up the shadows in one and darkening the highlights in the other, and you blend both together. In this case, with luminosity mask. Why can’t you brighten up the shadows and darken the highlights in the Raw image? Remember the greatest strength of luminosity mask is also its weakness. The tonal adjustments will bleed over into the shadows and the highlights. If you do it separately in 2 images, you don’t have to worry about that because you’re going to blend it. Shadows that are brightened up in the highlights priority image will be recovered by the shadows priority image and vice versa. Now, because only a single image is used, you wouldn’t have a problem with ghosting! That's it and I'm glad you made it to the end! I hope I've given you a good overview of luminosity mask and what you can potentially achieve with it. If you like more tutorials related to luminosity mask, you can find them in the “Related Posts” on the sidebar navigation menu. 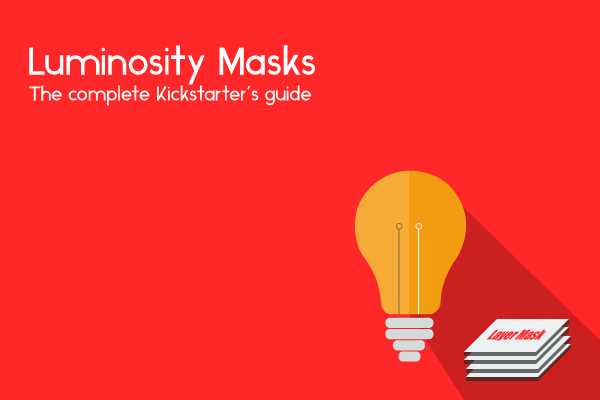 There aren’t many video courses that explain luminosity masking extensively. Having said that, these two video courses are probably the best there is on at the moment. I have watched them both and I can honestly say that these are of high quality in terms of content and value. 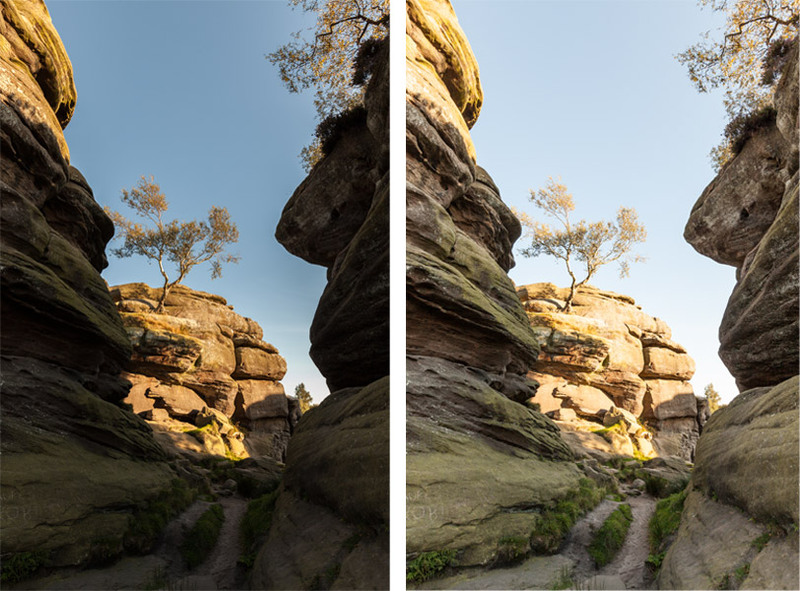 Both are excellent resources that focus on a slightly different aspect of luminosity mask in post-processing. Alternatively, search “luminosity mask youtube” and you’ll find plenty of short tutorials. If you want to learn more about luminosity mask and take it to the next level, I highly recommend The Art of Digital Blending by Jimmy McIntyre. There are 11 videos that come with JPEG files for you to practice as you go along. Each video is concise and straight to the point. Besides covering the basics of luminosity mask in great detail, you’ll also learn how to blend in six different scenarios. It comes with a PDF of the entire course. You can read my full review on The Art of Digital Blending here. Another awesome video course is the Complete Guide to Luminosity Masks, 2nd Edition by Sean Bagshaw. This video course focuses entirely on luminosity mask only. Each video is much longer and dives deep into the topic. 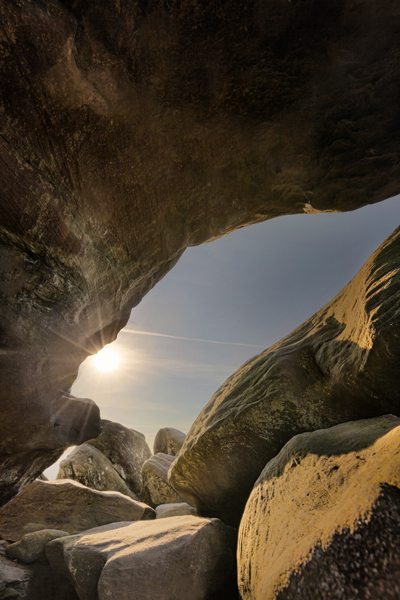 At the end of the course, you’ll learn both the basic and advanced use of luminosity mask in post-processing. I hope you’ve enjoyed this tutorial and learned the fundamentals of luminosity masking. If you’re still feeling confused, try An Idiot’s Guide To Luminosity Masks where everything is broken down into smaller chunks for to help you get around the concept. Don't forget to download the Photoshop Actions or a panel now and start experimenting with it today! The key to master luminosity mask is to have plenty of hands-on. Once you start getting use to it, I promise you’ll see a difference in your images. What is the preferred editing software you use for your work? I do not understand what you mean or how to subtract an mask, in the flat example problem. Do you mean the example on flattened shadows? If you simply choose a dark luminosity mask and apply tonal adjustment to brighten the shadows, it will make your image lose contrast and appear flat. The trick to brighten shadows without losing contrast is to pick a dark luminosity mask that targets the shadows, then subtract the darkest darks from it. Essentially, you’re brightening the “less dark” shadows while protecting the tonality of the darkest dark to maintain the contrast. Just one remark, all those “Plug In’s” you mention are not Plug In’s. They are scripts which are initiated from a Photoshop Panel. The only real Plug In’s for Luminosity Masks I know, which have higher quality of masking, are NBP Lumizone and Know-Transfer Mask Equalizer. I use TKActions panel and have gotten used to it in my workflow. Haven’t tried any other panels because I’m not sure how these will add to my workflow. Perhaps you can shed some light if you have used other panels before? Thanks for the tutorial. I believe the steps you listed for creating the dark masks are incorrect. Each dark mask you create should be successively darker, yet following your manual steps makes each mask lighter than the last – this is because you’re inverting each brights mask in your instructions, rather than just inverting the first bright mask and then performing an intersection of each successive mask thereafter to properly create the dark channels. I see the same issue in the youtube video you posted. I checked the PS actions file you kindly provided and it has the correct steps for the dark masks. Thanks for pointing that out! I’m currently away from my workstation (basically my regular iMac) so I shall look into it when I’m back next week. Davide has some great writing on Photoshop and he mentioned your blog. Thanks, Mark! I just checked out the article, that’s a great technical explanation on luminosity mask. Yaopey, I think you should link to it in your “Learn More” section. It really goes deep explaining the concept. Hi Owen, thanks for your comment, that’s a great suggestion! Very informative but when I start to begin to subtract brights and darks (after the 1st channel) i get a message “no pixels are more than 50%. The selections edges will not be visible”. a HUGE thank you. I’ve been struggling with the “imperfect mask” and this definitely cleared things up and gave me some ideas. Hi Trey, I’m really glad it solved your problem! Just out of curiosity, what do you mean by “imperfect mask”?